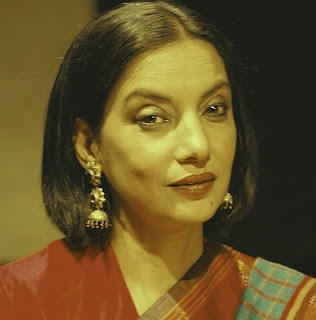 The outrage over Shabana Azami's comments, especially the extreme reaction of filmmaker Ashoke Pandit, composer Aadesh Shrivastava and director Shashi Ranjan is quite misplaced. Firstly, it is a problem which we must understand. Today, it has become immensely difficult for a Muslim to get a house on rent in urban areas of this country. The problem is more in North, Western and Central India, while it is comparative less in the four Southern states [not entirely absent though]. I have faced the situation so many times. It's terrible, you feel really bad. Every time you go house hunting it's the same. It's got nothing to do with vegetarianism or non-vegetarianism. Of course, it's a good shield to say, 'We don't give house to non-veg eaters than directly say, We won't let you in because you are a Muslim'. The trio--Aadesh Shrivastava, Ashoke Pandit and Shashi Ranjan, have no idea about the situation. People are even objecting if somebody in a society (housing colony) gives a flat to a Muslim tenant. The landlord is asked by others, to desist from giving his flat to a Muslim. Mr Pandit, this culture (as you said) can't get respect but only contempt. It is pure bigotry and hypocrisy. Like, a guy wants Rs 25,000 (rent) for his big house and a Muslim comes, he may allow him. However, if the rent is Rs 2,000-5,000 and a Muslim knocks at his door, asking whether the house is vacant, the landlord would, in most cases, wait for some one else. If a few Muslims manage to get house, then it is because they have fat pockets and can pay more than the market rate. Ask any Muslim and you will hear a similar tale. One can't imagine how bad it feels unless he has experienced this 'rejection' himself. Sadly, this is leading to a serious situation. Urban ghettoisation across India. Two cities in each City. A Hindu City and a Muslim. It will be a horrific situation in future. Unfortunately nobody sees it serious. Our glorious composite culture is facing extinction due to this divide in each Indian city. And no politician sees it as an issue. Shabana has spoken and is being ridiculed. This is the same hypocrisy for which we are known. There is a problem, let's accept it. I wish the governments could embark upon 'forced segregation' like in Western countries including America where the racial divide had led to a similar situation. There should be housing schemes and constructions in new areas in such a way that all religious communities should have a fair mix. Housing societies on religious, linguistic and community lines must not be encouraged. The beauty of a society is in its diversity and the harmony with which different communities live together and understand each other's culture. I know, Shabana, can buy a house, an entire apartment, but how many have her financial status. But, if she has spelled it out, it doesn't need to be condemned. It's our age-old practice to not confront our own biases. Yes, we have an issue, this society has a problem. Accept it, disccuss it and have a discussion. Why can't we sort it out? 3. What about ghettoes of Gujaratis, Christians, Jains, other castes?